and the Cayman Brac website. Crystal clear water, scuba diving, open beaches and tropical breezes. Cayman Brac is a Caribbean Island paradise. 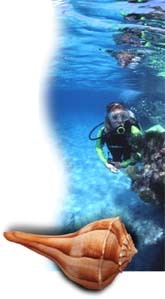 To see what our island has to offer, click any of the shells at the top of the page. See a larger version of any photo by clicking on the image. For additional information about on-island subjects, contact Cayman Brac businesses listed in the website. © 1998-2018 Chris Crumley Productions, Inc.